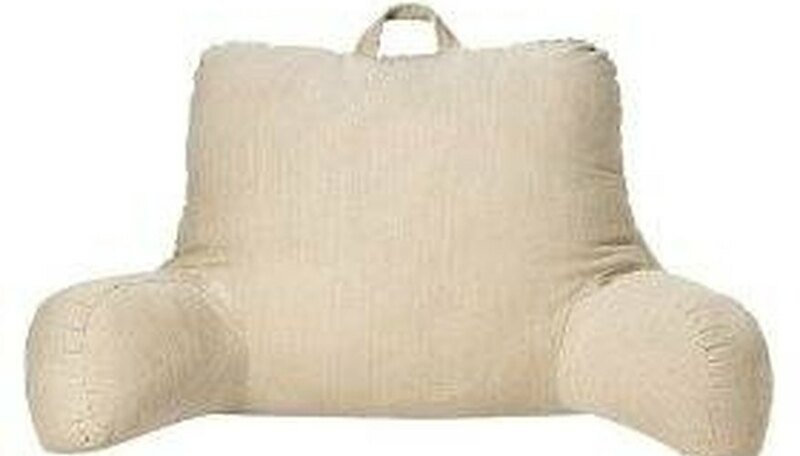 If you like to read, do crossword puzzles or watch TV In bed, then a bed rest pillow is the most comfortable way to go. Trying to get your regular pillows around you to get comfortable just doesn't work, and you end up with a sore back. Making a bed rest pillow is an easy project that takes about an hour and gives back hours of enjoyment. These pillows also make great floor pillows for the kids while they play video games. You can purchase fabric with their favorite character or football team so they will really love it. Compared to purchasing the pillow in a store, this is a very inexpensive project. Make a paper pattern out of some brown wrapping paper by measuring 22 inches across the top, 11 inches down each side, 17 inches out to each side and another 8 inches down. The bottom should measure out to 56 inches. Fold the fabric in half and pin the pattern to it. Cut out the pattern. You should have two pieces. Cut another piece 5 inches by 122 inches. This can be pieced together if you can't get a continuous 122 inches. Fold the ends of the long strip over and sew across the 5 inches with the wrong sides together. Then starting in the middle of the bottom of the pillow piece, sew on the strip all the way around with the exception of the last 4 inches, again with the wrong sides together. If the strip is a little too long, that's OK. Just leave it for now. Sew the strip to the other pillow piece, wrong sides together, all the way around with the exception of the last 4 inches. Turn the pillow right side out. Stuff the pillow with poly fiberfill. Start with the arms and fill them until they are very firm. Then start filling the pillow part. When you get to the arms, turn them at an angle that will be comfortable for you and continue stuffing. It may take moving the stuffing around a little until you get the hang of keeping the arms at the angle you want. You need little stuffing toward the outside of the pillow and a lot toward the inside to keep them in place. Once you get it stuffed where you believe it will be comfortable to you, hand-stitch the opening shut. If the strip was too long,fold it and tuck it up inside the pillow and sew it shut where it's tight. If you are an experienced seamstress, you can use a welting between your seams to make your pillow fancier. If you want to make you pillow cover washable, leave half of the bottom seam open, stuff with foam and use Velcro to close up the seam. Then you can take the cover off and toss it in the laundry whenever you wish.